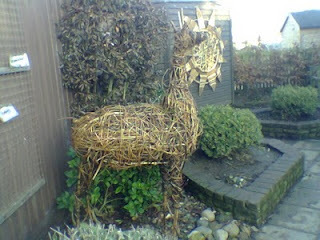 we are now in the busy period for living willow sculpture. 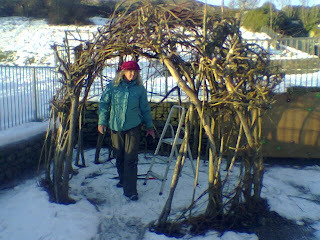 this week we have worked with children to make living willow domes and tunnels at Sessay C of E Primary School, Thirsk, Calverley Cof E Primary School, Pudsey and Chapel Stile C of E Primary School in Langdale,Cumbria. The weather has been kind to us this week and today we cut more willow rods for our projects next week. We are planning to run a workshop on making Simone's unique hearts and stars in time for Valentines Day. 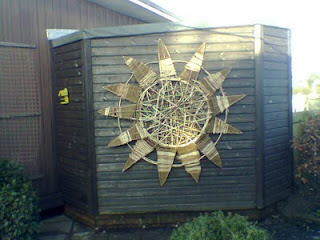 Simone was the originator of the woven willow hearts and stars now seen in glossy gardening and countryside magazines and on other peoples websites. From what we have seen other 'willow weavers' offering for these workshops their creations are pretty poor imitations of Simone's original designs. As Cumbria's longest established willow weavers we have decided to begin running workshops in the Carlisle and Kendal area due to popular demand from people meeing us at the local events that we display at. The dates and venues are still to be decided but if anyone is interested please email us. 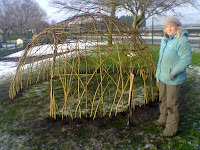 Despite the bad weather we have been able to carry out some Living Willow work this week. We repaired 3 ten year old arbours that we had built as part of Sefton Living Shade all those years ago. The arbours had not been looked after properly and required some severe pruning to get them back into shape. 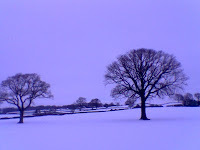 This was at Hudson Primary School in Maghul, nr Liverpool and the day was cold and snowy! The second job was at St Gregory's Catholic Primary School, Lidiate nr Liverpool. 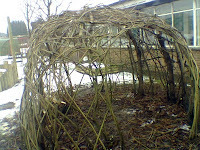 We made a willow dome with help from the pupils in years 4, 5 & 6. We had to scrape the snow away from the site on the school field but it was a much milder, thawing day and the sun even appeared just as we were completing the dome. The staff and pupils were very happy with their new outdoor 'classroom' and have already recommended us to a couple of other schools in the area. 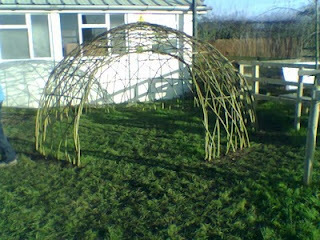 We still have some free dates in March and early April if any schools are considering have some living willow work. 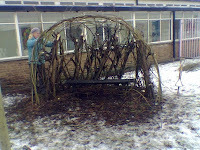 The continued arctic weather means that we are unable to start any of our willow projects at schools. Most schools are closed at the moment and anyway the ground is frozen and covered with snow. 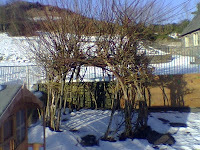 However we have struggled out to cut willow in readiness for the thaw. The only problem is that we have had to leave the rods standing up in the willow bed because we can't get the van anywhere near to load up! We have had to stand the bundles up because otherwise the rabbits will chew all the bark off the rods! We have managed to get back in to work mode this weekend. The lanes are still packed with ice but we were able to get to our friend Barry's garden in Carlisle on Saturday to do the annual willow harvest from his garden. 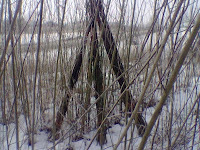 It was really peaceful cutting willow in a quiet garden with the snow crunching underfoot. 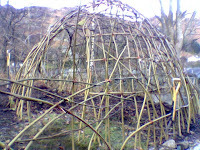 Today we went to Staveley C of E School near Kendal to finish a repair job on a neglected willow dome. The school is in a great setting with good views of the snow covered Cumbrian fells. The pictures are of before and after repair work.